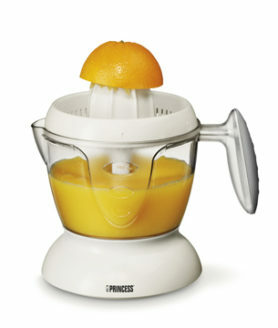 Easy to use citrus juicer with 2 cones, for citrus fruits. Automatic switch on and automatic left and right rotation for a higher juice yield. 1 litre removable transparent jug with level indicator. Quick and easy to take apart for cleaning. Includes cord-storage and pulp control. Handy juicer with automatic activation function and left and right rotation mechanism. Removable, transparent 0.75-litre measuring cup. Can be completely dismantled for easy cleaning. Complete with cord storage facility, dust lid and pulp filter. Very practical and innovative smoothie maker. Makes tasty and healthy smoothies in seconds! Can be used with fruit, vegetables or yoghurt, but also for crushing ice. This smoothie maker comes complete with 4 blades that can be used in several positions, including a Turbo Boost function that lets you crush ice. Including a plastic jug that can be easily cleaned in the dishwasher. The smoothie maker starts automatically when tilted upwards. The ultimate juicer that offers perfect performance and results! Improve your health, fitness levels, complexion and figure by drinking fresh and tasty vegetable and fruit juices, packed full of vitamins, every day. With a very safe locking system. Features a large funnel with a 75mm diameter to accommodate large pieces of fruit and a handy removable 1.8 litre pulp collection tray. Can be completely taken apart for easy cleaning. The juicer features two speeds. Nicely designed stick blender, fitted with a removable stainless steel stick. The stick blender is equipped with 2 speed positions, made of rubber, which provides extra grip and comfort.